With the warm weather and light rains, we were pleasantly surprised that it was time to harvest from the demonstration gardens. Arugula and radishes planted in April are ready! Did you know that different types of plant have specific harvesting procedures? Stand over the bed and work backward as you harvest. The tote that you harvest into, will sit on the bed where you have just harvested. Start about two feet in from one end of the bed. If you are right-handed, you will have your knife in your right hand and you will use your left hand to hold on the greens. You should be able to reach two feet in front of you. Start on the rightmost row of greens. With your left hand, hold onto the greens you want to cut, and cut two feet of that row, pulling the knife towards you. Let your left hand build up a small handful of greens. Drop the cut greens into the tote and repeat the process going through all of the rows from right to left. Once a two-foot segment is harvested, shuffle backward and repeat. The fundamentals of harvesting both kale and chard are basically the same. The goal is to pick the bottom outer leaves of the plant first. This will cause the plant to grow upwards to form a stalk almost like a palm tree. Chard doesn’t quite grow like that, but hand picking it is the same idea. When growing kale as a fall or winter crop, be sure to pick it a few times before snow or really cold weather arrives. If there are any kale leaves that touch the snow-covered ground, the kale leaves will rot on the plant. This can cause the whole plant to rot as well. Harvesting squash is very easy, but it is a good idea to wear long sleeves and gloves while you do it. The plants are a little thorny and they can make your skin quite itchy. When harvesting squash, walk between two rows and harvest both rows as you work your way down. Use a small knife or snap the fruit off at the base of the plant to harvest. Harvesting tomatoes is very easy, but you do need to be careful not to bruise them. Some types of tomatoes bruise easier than others. You will find that any of the big heirlooms that are juicy will bruise very easy. To help prevent bruising, harvest tomatoes in crates or boxes that are shallow and can be stacked on top of each other. Do not pile tomatoes up on top of each other, as that may cause them to bruise. We will have produce from our harvests at the garden "farm stand". Dates and times will be posted on our website, Facebook, Instagram, and on the message board at the garden. 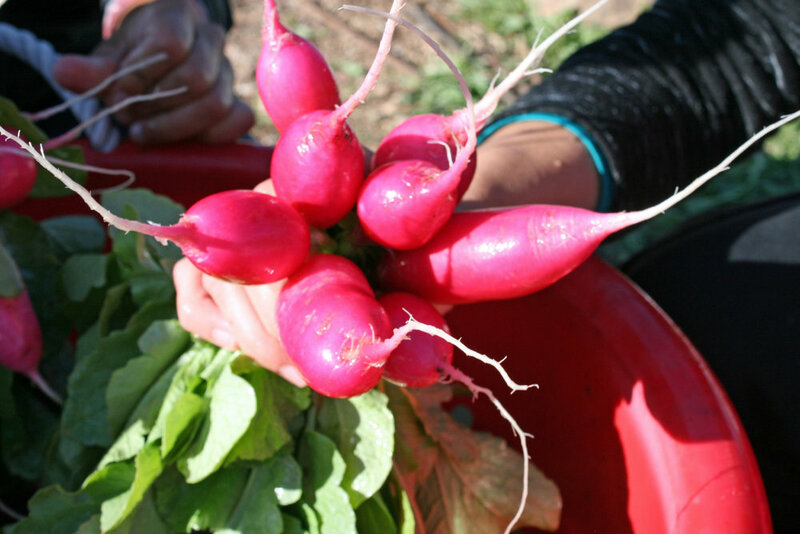 This week we have radishes, arugula, and chives.